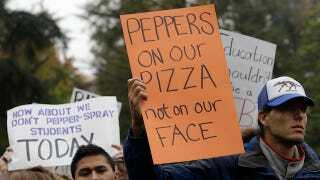 Megyn Kelly's claim that pepper spray is "a food product, essentially" has quickly become infamous. Let's take a look at the ways this "food product" fucks people up. Deborah Blum of Scientific American points out that pepper spray is indeed made of capsaicins, the same compounds found in peppers, which are foods. However, the police-grade spray is nearly five and a half times hotter than the hottest known pepper, the ghost chili. This chili has itself been likened to "a cocktail of battery acid and glass shards." UC Davis student David Buscho, who was pepper-sprayed while protesting on Friday, says, "It felt like hot glass was entering my eyes." See a pattern here? Blum also notes that repeated pepper-spray exposure can cause corneal damage. Buscho told the AP, "I had my arms around my girlfriend. I just kissed her on the forehead and then he sprayed us. Immediately, we were blinded ... He just sprayed us again and again [...]"
A 1995 ACLU report found that pepper spray was associated with 26 deaths in California between 1993 and 1995 — that is, about 1 in every 600 people sprayed by California cops died. Most had pre-existing conditions like asthma, but the report notes, "these findings suggest that pepper spray may be a serious complicating factor when it is used on people with cardiovascular or cardiorespiratory disease — individuals police might not be able to recognize readily in an emergency situation." The ACLU report cites a 1993 US Army study which found that pepper spray's active ingredient "is capable of producing mutagenic and carcinogenic effects, sensitization, cardiovascular and pulmonary toxicity, neurotoxicity, as well as possible human fatalities." According to Discovery News, pepper spray is banned for military use overseas by the Chemical Weapons Convention, which prohibits the use of "any chemical which through its chemical action on life processes can cause death, temporary incapacitation or permanent harm to humans or animals." So basically, pepper spray is a "food product" that could cause cancer, eye damage, and/or death, and feels like molten glass in your face. Who wants some?